An MP has urged campaigners not to give up on the fight to save a secondary school in South Tyneside which is threatened with closure. South Shields MP Emma Lewell-Buck said there are 30 other schools nationally rated ‘inadequate’ in standard by Ofsted - in the same precarious position as South Shields School. Mrs Lewell-Buck was speaking at a meeting of the Save South Shields School Group - an independent body of parents and other supporters. They are battling to keep open the school, in Nevinson Avenue, which welcomed its first pupils in September 2011. Ms Lewell-Buck told the meeting: “Please don’t give up. The school was built under the government’s controversial PFI scheme. Its build contract means £400,000 a year must be repaid to investors until 2036 - whether or not the building functions as a school. Despite standards improving under a new leadership team, the school faces closure in 2020 unless a sponsor can be found to transform it into an academy. Around 22 people, including borough councillor Angela Hamilton, attended the meeting at the Whiteleas Club, South Shields. Meeting chairman Phil Brown said it was important supporters continued to push for the school to remain open in the long-term. He said: “As slim as chances seem in the dark days before Christmas in terms of sponsors, we just have to have the hope. 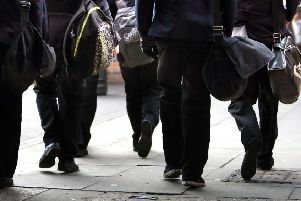 A spokesman for South Tyneside Council said: “In line with the requirements of the statutory representation period, the council is continuing to engage with parents and students through the agreed consultation process which is based on national guidance. “Since mid-August a helpline has been open, and remains open, for parents to ask questions and receive support and information. “A letter was sent to all parents advising them how to engage in the consultation process. “We have arranged two public meetings and five drop-in sessions with parents with a further one planned for December.